Let the ingredients speak for themselves. It has been said more than once when discussing the merits of Italy's contribution to the culinary art but it is philosophy that has stood in good stead cooks the length and breadth of the peninsula for hundreds of years. Naturally it is also one that lives or dies by the quality of those ingredients. In the case of salad leaves, freshness and quality are vitally important for the simple reason that in many cases they are eaten raw, or crudo. One of Italy's more celebrated areas for growing greens is the Veneto, in the north-east of the country. 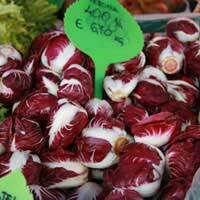 The town of Treviso even lends its name to a delicious and much celebrated member of the chicory family, radicchio, which can either be added to a salad or incorporated in a risotto or a pasta sauce. In northern Europe, star status in the 1990s was conferred on two varieties of Italian lettuce, lollo rosso and its close cousin biondo, prized principally for the outer frills of the leaves that meant presentation was less of a headache for image conscious restaurant cooks. Another recent fashion icon has been rocket, its peppery leaves beefing up many a green salad or providing a more muscular backdrop to a plate of cured meat. Spinach is better known as an ingredient or side order when wilted in a hot pan, but it can be enjoyed in its raw form, too, although the relatively soft texture of the leaf requires that a more raw robust green accompany it in order to bring some added bite to the table. Herbs such as flat-leaf parsley and mint can also contribute to a bowl of greens but avoid using sage at all costs - in its raw form, the leaf has an unappealing furry, indigestible texture, and the undeniable qualities of the herb only become apparent when used as part of the cooking process. Whatever leaves are chosen to make a salad, the first and most important part of the process is washing in cold running water to remove impurities and ensure that the unappetising sound of grit between a diner's teeth is avoided. As far as preparation is concerned, it is really a matter of how important presentation is. Some cooks like to shred their greens to allow for greater integration of colour and texture. A more basic reason may be that it makes a salad easier to tackle with only the use of a fork. However, chopping serves to destroy the integrity of the different leaves and in some cases the dramatic patterns of colour that can add vitality to the salad bowl. It should be remembered that the salad leaves should not be dressed until the last minute, otherwise the result will be a soggy mess bearing no relation to the natural beauty of the leaves when they were originally plucked from the earth. So whether you are using balsamic, wine vinegar and extra virgin olive oil, or livening up the palate with the addition of lemon juice, toss the leaves at the last minute.